Heat the pan with oil and splutter the cumin seeds. Throw in the onions and scald well. Stir in the ginger garlic paste and finely saute. stir in the tomatoes and cook till it turns mushy. Drop in the carrots, mashed green peas and scald well in the masala. Add the salt as well. Add the pav bhaji masala and the red chilli paste. Mix well with the veggie's. Add / sprinkle little bit of water so that everything blends well with the masala. Sending this to BOOKMARKED EVENT going on @ Aipi's blog, started by Aipi n Priya ..
so colorful looking Shanavi. love to have it hot and steaming. yummy yumm yummy.. colorful and delightful.. nice clicks too..
அடிக்கடி வீட்டில் செய்வது..எனக்கு ரொம்ப பிடித்தது...சூப்பரான க்ளிக்..
Yummy pulao! It's very tasty as well! so colorful and fresh.. nice picture ! Looking delicious and colorful Shanavi. 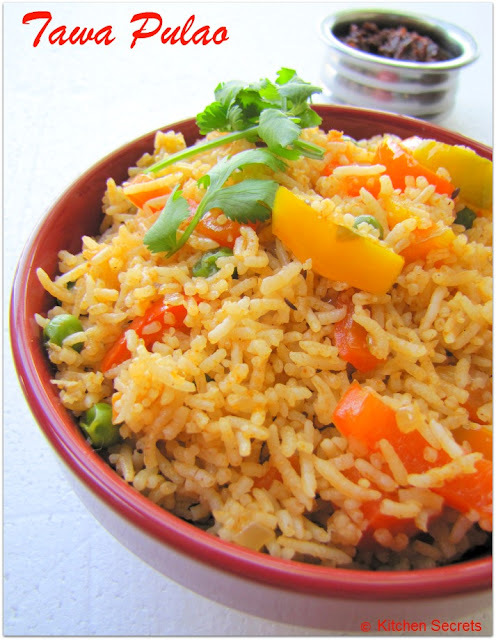 beautiful clicks dear...pulao sounds yummy. Antha full plateyum appadiye yeduthukalam pola irruku,very colourful and inviting pualo.. Colorful & inviting dish...I love All SK`s recipes..!! make it all the time- loved the platter-yum ! wow nice colorful and wonderful pulao !! awesome clicks !! so colourful and yummy dear.love to have it anytime. Colorful and yummy rice,makes me hungry..beautiful clicks dear. colorful and tempting dear!>..chef Sanjeev, truly is one of the best out there! yum my fav street food. looks so colorful and tasty. Tawa pulao looks awesome delicious. Tawa pulao looks so colorful and delicious..
Belated Congrats on you milestone dear..
colourful & grainy rice..never tasted or tried before, your puloa tempting me to try it..
An all time fav- simple yet so flavorful! 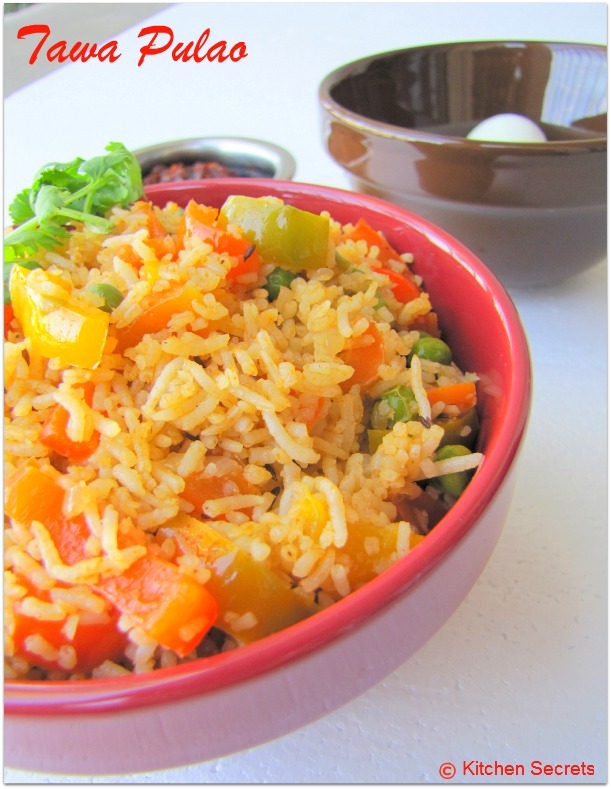 very colourful n delicious pulao..
Shanavi, plz collect FOOD MAZAA AWARD from my blog.